When water from rainfall or melting snow flows across the landscape, it washes soil particles, bacteria, pesticides, fertilizer, pet waste, oil, and other toxic materials into our lakes, streams, and groundwater. This is called "nonpoint source pollution" or "polluted runoff." Nonpoint source pollution comes from a diverse number of activities in our daily lives including fertilizing lawns and farm fields, driving and maintaining our cars, constructing buildings and roads, plowing our fields for crops, and maintaining our roads in the winter. Urban and rural nonpoint pollution is the leading cause of water quality problems in Wisconsin, degrading or threatening an estimated 40 percent of the streams, 90 percent of the inland lakes, many of the Great Lakes harbors and coastal waters, many wetland areas, and substantial groundwater resources in Wisconsin. * Polluted runoff contributes to habitat destruction, fish kills, reduction in drinking water quality, harbor and stream siltation, and a decline in recreational use of lakes. Runoff from municipal areas contains a mixture of pollutants from parking lots, streets, rooftops, lawns, and other areas. These areas contribute heavy metals, pesticides, sediment, nutrients, bacteria, and oxygen-demanding organic waste. Although municipal storm sewer systems are efficient at controlling water volume to avoid flooding, they also transport polluted runoff directly into nearby lakes, rivers, and streams without the benefit of wastewater treatment or filtration by soil or vegetation. Discharge Elimination System, the WPDES Stormwater Discharge Permit Program regulates discharge of stormwater in Wisconsin from construction sites, industrial facilities, and selected municipalities. Municipalities with a Separate Storm Sewer System serving a population of 100,000 people or more must obtain a WPDES Municipal Stormwater Permit. There are five Great Lakes Areas of Concern in Wisconsin. These are areas on the Lake Superior and Lake Michigan coasts that have persistent runoff-related water quality problems including Green Bay, Allouez, Ashwaubenon, DePere, Marinette, Sheboygan, and Superior. See the EPA Great Lakes Areas of Concern Website for more details (www.epa.gov/grtlakes/aoc/). In certain Priority Watersheds, stormwater runoff is a primary source of pollutants. 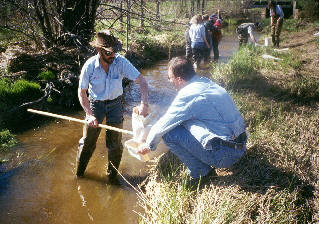 Thus, controlling nonpoint pollution is especially important in these areas to help improve water quality. 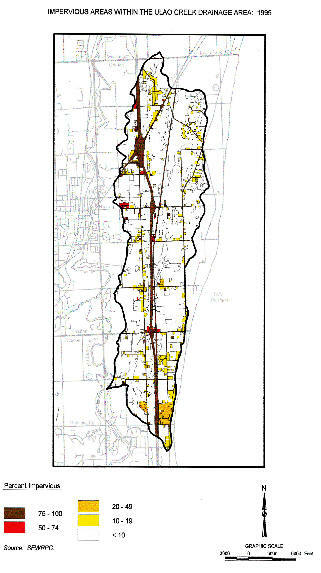 Within the state's Priority Lake and Watershed Projects, Eau Claire, Racine, West Allis, and Waukesha have populations over 50,000. The Department retains the authority to designate a municipality as a significant source of pollutants. Such a municipality would then be required to obtain a Municipal Stormwater Permit. The following municipalities each have a current municipal storm water permit as of May 1, 2001. About 80 additional municipalities are in various stages of the municipal storm water permit process (e.g. designation, pre-application, permit drafting, etc.). Report, Wisconsin DNR, December 1999. Impervious areas within the Ulao Creek watershed (1995 SEWRPC land use delineation). Greater than 10% impervious surface in a watershed has been proven to significantly impact water quality and contribute to stormwater runoff.